This entry was posted in Uncategorized and tagged broccoli, bulgar, food, market, recipes, squash. Bookmark the permalink. That is one special looking salad. I haven’t tried that type of squash before. Lovely, lovely looking salad. I see what you mean about the recipe, it does look a bit busy. Glad to hear it all came together. I like your bulgur addition, however I have a barley fetish at the moment so may just try the original. Yeah, love the colors and I could do with either grain, too. Maybe eggplant could also stand in for the peppers/ tomatoes later in the summer…. ohh, yummmmm. There was squash available in April?? 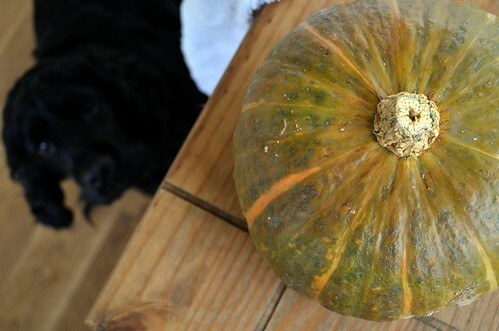 I can only find squash in the fall and winter. Which, of course, i have a HUGE craving for at the moment. PS … Marco is soo adorable. He looks very huggable. 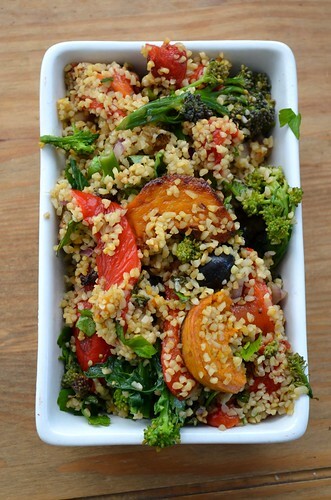 Love bulgar, dislike sundried tomatoes…this dish looks scrumptious Wendy! Great recipe. I tried it at home. I will be offering it to my clients.